Family Vacationing in Virginia Beach - especially, families who are coming from different parts of the country and don't see each other often - should definitely take photos together - whether it's with a cell phone or by calling us to capture it professionally for you! That's what Debbie did. She reached out to us for family portraits when they visited VB from Kentucky this summer. They rented a home down in Sandbridge - right off of Back Bay. It was a beautiful evening - when I met her. We started with photographing the entire family together - Debbie, with her 2 sons, their families and her husband with his daughter and all the grandchildren. From the initial family portrait grouping, we then photographed each of her son's families - from a little baby girl to teenagers into collage- kids ages 1-19! Then we photographed Gramma Debbie with her grandkids, her husband with his daughter and grandson and then got everyone together again for another full family portrait. This time, we let the kids actually help orchestrate where they would all sit or stand and had a bit more fun with the final portraits on the dock (as you see in the last photo below!). The one thing we offer as a full service portrait studio, is the ability to help create a perfect portrait. This works great for large family wall portraits, where there's a good chance, one person is blinking or a child is sticking his tongue out or mom just loves how she looks in another pose. The best image of each person, the best expressions, genuine smiles - we are able to combine images from the same poses and create a seamless final image that our clients will love. A piece of art they will treasure for years to come. An heirloom to pass on to the next generation. It was a great day for picture memories and we were happy to provide. Her comments to us when she received her portrait order in the mail: " O.M.G. Erin~~~~these were so worth the wait! Doubt that I can stand to wait til Christmas to gift them. Thank you again for your special talent." It makes us proud to receive comments like that! Certified Professional, Master Photographer, Erin Clark, spends several weeks each year traveling around the country, specifically in the Pacific Northwest. 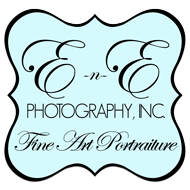 The rest of the year, she resides in the city of Virginia Beach with her retired US NAVY, husband, Eric (the other 'E' in E-n-E), their son, three pups & 2 cats, spending most days at E-n-E Photography, Inc.,their London Bridge Rd. studio. If you are not in the Virginia area and are looking to book a session with Erin, please contact her for dates.